Working on the design and layout for the SB-101 rebuild and knowing that a transverter would be required to work with it set me thinking about the interface between the two units and the layout of the transverter. This page will record the progress of the transverter design and construction. The original intention was to use low loss ceramic switches with a single set of circuitry to cover the three bands 50, 70 and 144Mhz and some prototype work showed that this could be accomplished electronically. 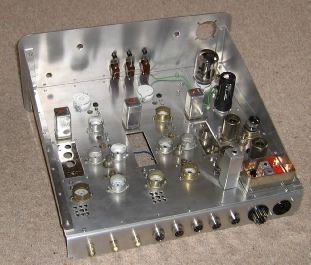 However, it could not be fitted into the depth of chassis size that was available (another SB-101 case and chassis). The layout was repeated by turning it 90 degrees so that the components went from left to right instead of back to front but this would still not fit into the available space so the switching concept was discarded and three separate transverters used instead, each with a 28-30Mhz IF. The next photo shows the final layout of a single transverter viewed with the rear panel on the left and the front panel on the right. It takes up one third of the chassis space of an SB-101. The left hand tin box holds the crystal oscillators for normal and repeater use. The right hand tin box will be the transmitter low pass filter and the change-over relay is immediately to to left of that filter. Both tuning capacitors on the right hand side will go underneath the chassis leaving more room for a larger low pass filter if required. The first photo shows the initial layout attempts with the switched arrangement in pencil on the left and the non-switched one on the right. The front of the unit is at the bottom of the photo. This has now been replaced by the following layout. Two days of work in the garage/workshop produced the chassis, front panel and bracing structures using fairly basic tools including a bench drill, vice mounted bending irons and a selection of files. The chassis and front panel are made from NS4 Half Hard 16SWG aluminium which is very strong but too hard to bend. The remainder are made from a bending grade 16SWG aluminium. 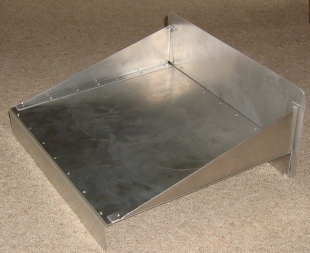 All that remain to be made are the two horizontal cross bracings that join the front and back together at the bottom of the front and rear panels and the retaining angles for the (SB-101) cabinet screws. Two further days and the main drilling and punching is complete allowing assembly to commence. The long slots will each hold a receive converter RF stage on a tin plate base as they have solder in valve-holders for the Nuvistors and cannot use aluminium. The oscillators for each band will be mounted in tin plate boxes as will the transmitter low pass filters. The rear panel holds the 11 way power connector, three RF output connectors, interfaces to three external transceivers, an interface to optional external linear amplifiers and the power and control interfaces to a separate 432MHz transverter. After a lot of work the 50Mhz transmit section is working and the 50Mhz receive section is waiting on completion of the RF amplifier. 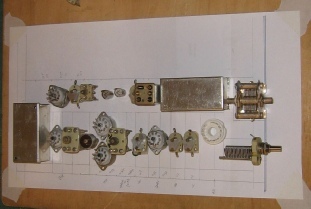 The box at the lower right of the picture contains the solid state (J310) simplex and repeater crystal oscillators - it proved impossible to get sufficient frequency stability with valve oscillators and modern miniature crystals. The transmitter PA generates 20W output on 300V but will eventually run on 420V where the linearity should be significantly better. A low pass filter for each band will be fitted next to each aerial changeover relay as shown in the second photo down from the top.